off today dealing with this. you don't know what a beautiful thing it is to be able to breathe. . . I've been dealing with a ridiculous "shortness of breath"
issue for nearly 3 weeks now. makes life miserable and my new training program torturous. we've treated it like asthma. I've approached it with meditation, prayer, magnesium. I'm going along with it, but I'm sure it's going to be a dead end. I'm still hung up on the anxiety diagnosis. but one way or another. take a big deep breath for me today and I'll see you tomorrow. prayerfully, on a new blog. i don't have the shortness of breath problem, but i am dealing with anxiety issues after the birth of my second child in may. honestly after all you've been through that sounds like a highly likely possibility. the ob and psychologist wanted to put me on zoloft, but i'm hesitant because i'm nursing. i'm about to try acupuncture this week, and i have high hopes for it after talking to the acupuncturist. i'll be curious to see what works for you... good luck!! The toughest part of anxiety is finding the trigger - once you deal with the issues and feelings that trigger these episodes you will deal with the shortness of breath. I've done the meds, therapy for a short time. I had a very wise and wonderful therapist I didn't have to be on meds or in therapy long to figure out what I needed to do - this wasn't a life sentence. I got the t-shirt and I aint ever going back to that time in my life. I still get anxiety attacks every now and then but I know how to control them - and thats the key I'm in control! Just thought I would pass on my experiences - hopefully you will find out what this is - and good luck with your running. When I was studying for the bar (not like that is anything compared to what you went through) I had a hard time breathing. I thought I had the flu and I couldn't figure out why I couldn't breathe. It was anxiety. I didn't have a solution and I still don't but it went away when I finished the test. how scary...and annoying! that's got to be bugging you big time! keeping fingers crossed that an answer/solution is found soon! I had a very similar experience. Many tests and an inhaler later, I gave up and went to a Naturopath who suggested acupunture. Turns out it was prolonged emotional stress and acupunture was amazing. It took some time, but I can finally breath and the tightness in my chest is gone. Good luck finding the answers. not breathing = not fun at all. and p.s. 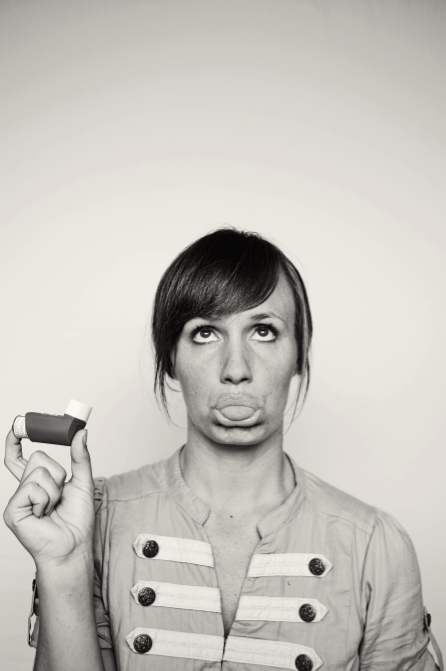 new blogs take back seats to health, so keep on breathing- we can all hold our breath for a few more days! This is Lydia :)...I met you in NYC earlier this summer during your instruction/filming in central park! your bang look great and your top is so cute...babe. good luck and love the pic!!! several years back i went through a divorce and was prescribed wellbutrin for depression. while taking it i could NOT breath...i couldn't take any deep breaths and at times it was pretty intense. i stopped the meds and it went away. as is obvious from everyone's comments it can be a lot of things. hope you get it figured out soon and that you feel back to yourself. my 10 year old daughter has this, at night, when she's trying to sleep. which is why i think it may be anxiety. linge crew: Poor Natalie has so much going on AND she just talked about how she can't even breath. Don't you think maybe someone else might be able to help you with your move? . . . So I haven't been on facebook much lately, but maybe you updated there. Any prognosis? Yuck! hang in there. Oh, that sounds bad, I meant diagnosis. ;) I blame it on the fact that it is late. Goodnight. But in all seriousness, hope you have received some answers as to the problem. I can't imagine trying to run and not being able to breathe at the same time, gosh I already can't breathe when running. A friend of mine had asthma-like symptoms but asthma treatments weren't effective. Finally, the diagnosis came down as "vocal cord dysfunction", strangely enough. IT didn't seem like vocal cords were the issue at all! Poor Natalie has so much going on AND she just talked about how she can't even breath. I had a very wise and wonderful therapist I didn't have to be on meds or in therapy long to figure out what I needed to do - this wasn't a life sentence. I know this is an older post and I hope by now your issues have resolved. If not, google "chronic hyperventilation syndrome". I have been dealing with this after some severe emotional stress. Breathing exercises and retraining are the key to feeling better. I love your photo! This plus the caption describes me to a T over this last month. I also had breathing issues. then I added in some chest pains. My doctor gave me an inhaler, but when I take it my pains let go some and I start shaking and feel dizzy. Then he gave me an anti-anxiety med to raise my serotonin levels. The breathing and chest pains are much better, but i'm still not sure whats causing it. I hope we all find a cure soon!! Your blog is so fabulous and inspiring! Thank you for sharing your talents! It really makes a difference for me. Had the same issue years ago. Went through flu, pneumonia, asthma and then told to live with it. Went on vacation and it got so bad almost had to call an ambulance. Came back and went to a cardiologist-I had pericarditis, a swelling (excess fluid) in the lining of my heart. Does it feel better or worse when bending forward? Do you feel a weight on your chest, and notice food going down when you swallow? For anxiety, it is usually more that you cannot yawn. Feel better soon!